After we competed a couple of times our wives started to get concerned that we might go a little overboard with our new hobby, but we had the bug. . . because we were winning!! We were taking trophies and ribbons in every competition we entered. At the time these competitions were divided into amateurs and professionals. People began to get upset that a couple of beer drinkin buddies with a Webber grill were taking home all of the awards, so we moved into the Professional Division to avoid bodily harm. We worked very hard perfecting our recipes and skills to compete with the pros. To our surprise, our winning streak continued, until one day we got a call from Hasty Bake. Hasty Bake was a local company that made top quality BBQ grills. They had been watching the progress of the Smokin’ BBQ team and were thrilled that a couple of locals were giving Tulsa a reputation for good BBQ. They offered to be our sponsor, and we were able to upgrade the old rusty Webber grill to a set of new shiny Hasty Bakes. We had also picked up an additional teammate, and changed our name to 3 Guys Smokin’. After a couple more years and a lot more trophies, we were approached by World Champion BBQer Joe Davidson of Oklahoma Joe’s BBQ to be one of his traveling professional competition teams. This meant a big Trailer Smoker and lots of exposure competing in the Professional BBQ circuit. At this point we realized our “hobby” might be more than just an excuse to drink beer with old college buddies. Soon after, a local Tulsa Restaurateur approached us looking for some BBQ Recipes that would make his restaurant stand out from the others. We were thrilled to help out and Steam Roller Blues was born. It became wildly successful and was named Tulsa’s best BBQ 4 years in a row. We adapted our competition sauces for Steamroller and found ourselves in the Retail BBQ sauce business. People began to stop by the restaurant just to buy bottles of our sauce for home use, and since then, all three sauces have won Multiple National awards from the NBBQA to the American Royal in KC and the Great American BBQ Challenge. We learned that we really didn’t need to complete as much, as long as our sauces and rub were winning awards in our absence. Even when we did travel to competitions we found ourselves competing against professional teams who were proudly using our products. Still, some would hide it by using duct tape to cover the logo on the labels but there was no mistaking the distinctive bright yellow border, or the flavors. 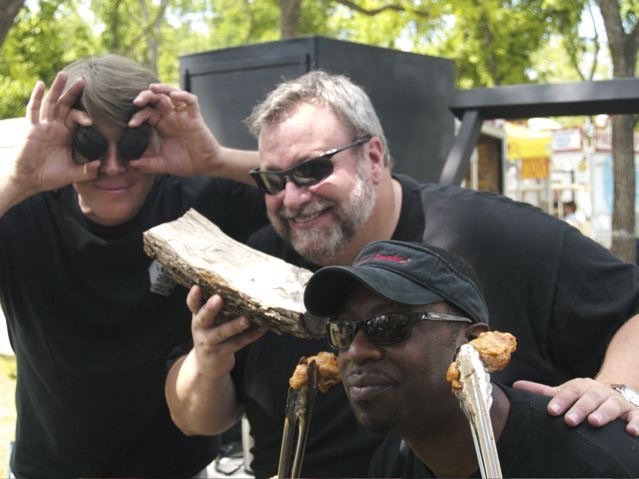 We wanted to start a festival that we could call our own, so we teamed up with a local charity and the Art of BBQ was born as Tulsa’s first officially sanctioned BBQ competition. A few years later the Rotarians in Bixby approached us to help them do the same and after 11 years, the Bixby Blues & BBQ festival has become the largest in the state of Oklahoma and one of the top 10 in the nation! It’s been 31 years and we still call it a hobby. Perhaps some day we’ll figure out how to make money from this thing. Keep the Smoke in your eyes and the Fire in your Heart”…………Smokin!!! Thank you guys for all you do in the BBQ world. I’m in the Oklahoma Air National Guard and soon to be retiring due to disabilities from the Gulf war. I’ve cooked for the job for so long and so many time I’ve lost count. I’m asked all the time how I make much good BBQ. I’ve never taken credit for the great flavores and always push your BBQ sauce whenever asked. It’s hard to improve on something everyone loves so I don’t even try. I’ll continue to make great BBQ and will sell your products every chance I get.